SCLA Support Staff Division | The Essential Ingredient! Please join your colleagues at the 2019 Long Island Library Conference, Lighting the Way, on May 9, 2019 at the Melville Marriott Long Island, 1350 Walt Whitman Road, Melville, New York 11747 from 8:00am – 4:00pm. The dynamic changes in the progressive advancement and the environment today dictate that leaders engage their team members to accomplish the organization’s vision. To accomplish this, the leaders need to have the ability to inspire and motivate those around them to become enthusiastic followers who are committed to achieving the Libraries Vision.This workshop will help participants identify the characteristics of visionary leaders. They will examine how leaders can lose their vision and develop strategies for maintaining visionary leadership with their staff. Participants will also learn how to tap into each staff member’s greatest potential to enable them to become strong partners in the development of their library. Learn the essential elements involved in the calculation of their retirement benefit; Acquire information on how and when to contact us to obtain their specific member information; Ask general questions relating to their benefits during and after the presentation; and Receive a detailed guide covering pension information. as circulation, Sierra, customer service, inter-loans and more. Refreshments will be provided and raffle prizes! SSD is pleased to present Michael Buono as he shares the ins and outs of Facebook Business Accounts. SSD members may attend for FREE. 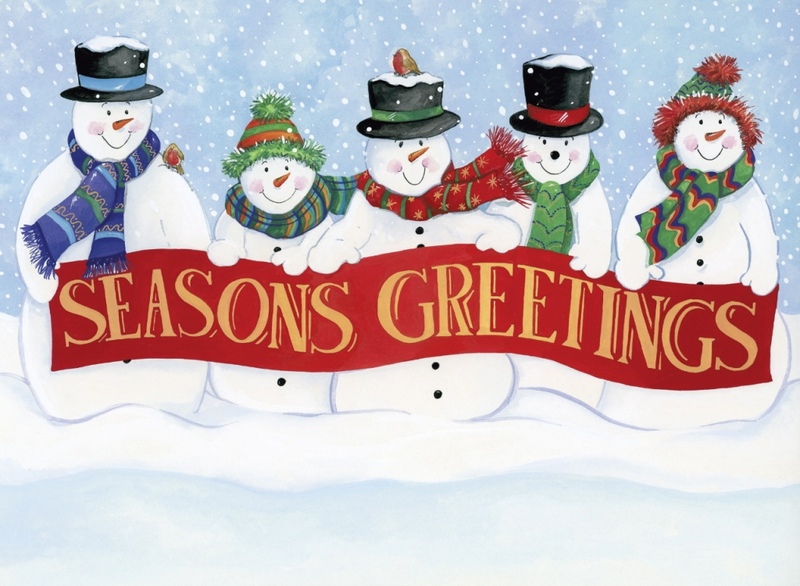 wishes you all the warmest greetings for the holiday season! Just a reminder that Web Junction provides free access to webinars focusing on libraries and library staff. Opening an account is FREE and easy! Take advantage of a great resource for training and growth. 2018 SSD 3rd ANNUAL SAFETY CONFERENCE a HUGE SUCCESS!! The SSD Annual Membership Meeting and 3rd Annual Safety Conference was a huge success! Over 50 participants attended the event which was held at the Brentwood Public Library on Wednesday, October 17th from 9:30 a.m. to 4:00 p.m.
Lee Mandel, CEO of Intralogic Solutions, gave a presentation of his product that links all building alarm systems together making them more efficient and quicker – a lock down in 15 seconds as opposed to 15 minutes! Intralogic Solutions also sponsored the refreshments served at the Conference. 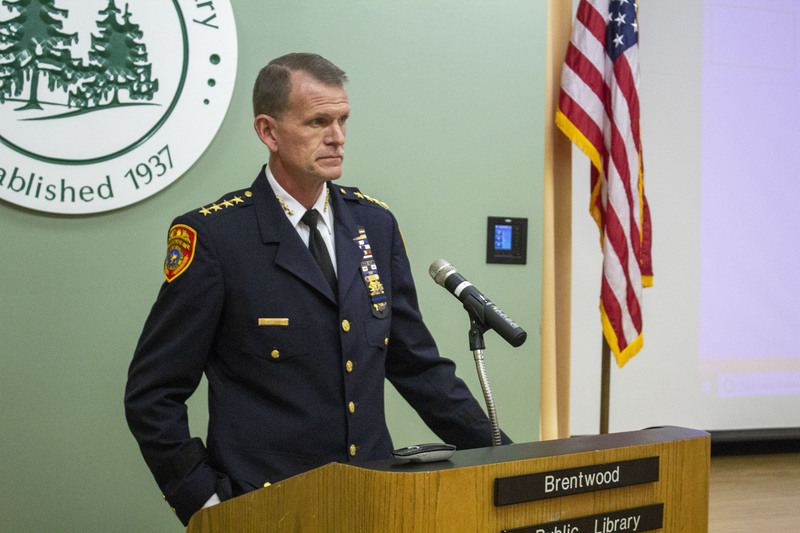 Stuart Cameron, Chief of Department of the Suffolk County Police Dept., was our Keynote Speaker. He spoke about the Smart 9-1-1 for Facilities: the RAVE panic button application that library staff are using to report active shooter, medical emergency, 911 calls; the shield program; results of the Department of Justice law suit compliance (today’s top Newsday story); and the public feeling comfortable calling 911 to report crimes/gang activity. Nicole Marks, MEP, CEM, NYS Homeland Security and Emergency Services for Long Island, gave an overview on Continuity Of Operations Plan (COOP) which is the next phase of planning for a disaster. Matthew Setteducati, Supervising Safety & Health Inspector, PESH, covered how to be compliant with the NYS Workplace Violence Law. PESH has consultants ready to help you develop your policy and become compliant with this very important safeguard for your staff. 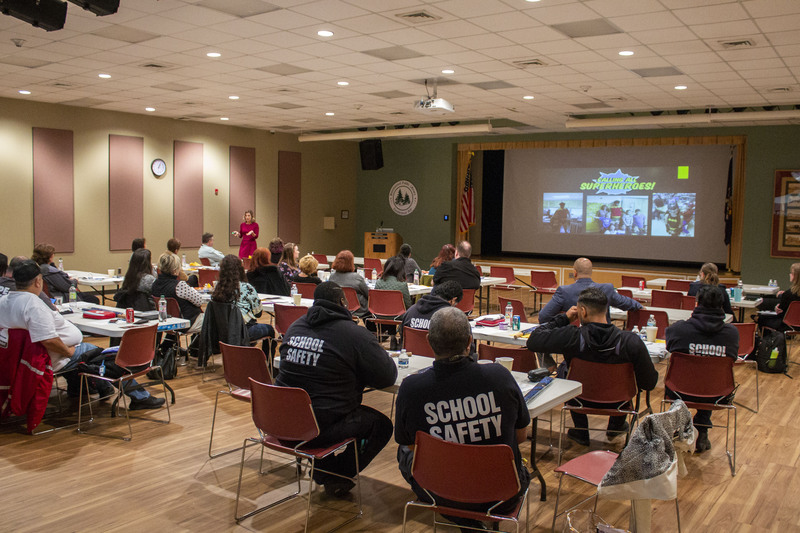 Jessica Price, School Counselor, Brentwood School District, provided strategies to incorporate EMPATHY into our everyday interactions and shared how these strategies are working in the Brentwood School District..
Stephanie Sloan, MS, CASCA, Senior Drug Abuse Educator, Suffolk County Division of Community Mental Hygiene Services, provided a NARCAN training session and kits for all participants. to help combat the rising incidents of opioid overdose. All participants left with invaluable information and various resources to keep their libraries and staff safer. 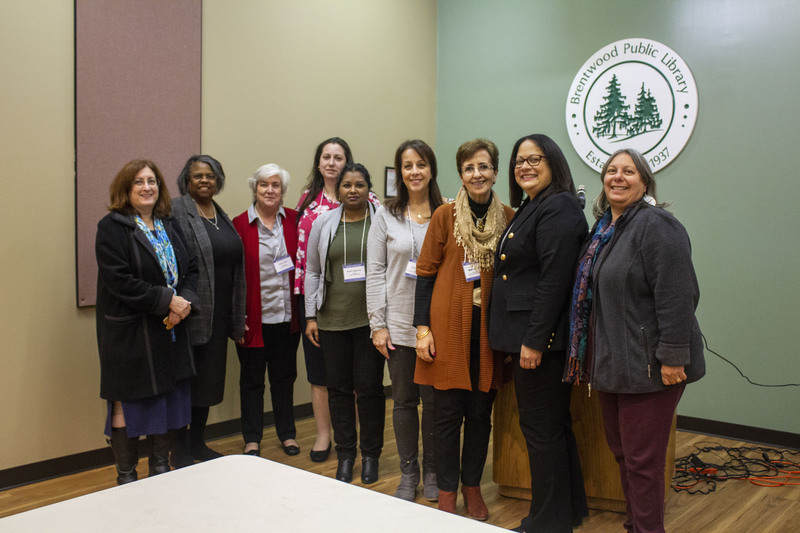 The SCLA Support Staff Division would like to thank Tom Tarantowicz, Director of the Brentwood Public Library, for hosting our event and for his consistent support of SSD plus his wonderful, helpful staff.